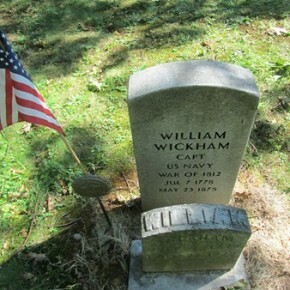 Captain William Wickham was a very important person in the early years of Sodus Point (then called Troupville). He was a founder of the Sodus Point Episcopal Church and a Postmaster for 42 years. He was a school commissioner. He also was Sodus Point’s first major merchant. His home served as a combination store, Post Office as well as a military storehouse and temporary troops barrack. He served as a Captain in the US Navy during the British War with the French. Wickham Blvd. in Sodus Point is named in his honor. During the Battle of Sodus Point that occurred on June 19th, 1813, he was away in New York City buying provisions for his store. Since his house was a post office and military storehouse, it was burned by the British. He lost his home and his livelihood. We know much more about the Battle of Sodus Point than we otherwise would because of this. He sent claims to Congress in 1816 and again in 1846 to recover the loss of his home. He based his claims on the grounds that his home was burned because government property was stored there. Unfortunately, his claims were never recognized. Due to his documentation in this endeavor, much of the history of the Battle of Sodus Point was preserved. Thomas and Elizabeth named their sixth child William. He was born on July 7, 1778 in Newport, Rhode Island. In his youth, William lived with the stigma of being a member of a loyalist family. When he was a small boy, William was playing one day with a friend on the edge of an enclosed field. Two men were talking on the other side of the fence. One of them pointed to William and said to his companion, “That little boy is the son of a notorious Tory!” The other man laughed, patted William’s head and said, “Poor little Tory. We’ll have to teach him better.” Then he shook William’s hand and departed. William later learned that that man was George Washington. William left home early, going to sea at the age of thirteen. In 1798, he was in the U.S. Navy during the War with the French. He also served with Decatur on the Tripoli expedition. He sailed all over the world, rising quickly in rank and becoming Captain of a ship at the age of twenty-one. Shortly after he became Captain, William sailed to Philadelphia with a cargo. While there, he visited the home of Frederick and Elizabeth Christian, a prominent family in the city, in company with Frederick and Elizabeth’s son. As the two men entered the house, they encountered the Christian’s daughter, Catherine. Catherine later remembered the scene to her granddaughter. There was a young man in Philadelphia who was attentive to me, and while I could not say I loved him, I thought more of him than of any other young man I knew. One day he invited me to go horse back riding and I felt that day he was going to ask me to marry him, and I had made up my mind to accept him. Just as I was coming downstairs in my riding habit, my brother came in the house with a young man whom he introduced to me as Captain Wickham. I knew right then I was going to refuse the other young man that afternoon, and I did. Later your grandfather asked me and we have been lovers ever since. When she heard this story, Lucy must have remembered first meeting Frederick in her garden in Norwalk. William and Catherine were married on Thursday, March 24, 1803 in Christ Church in Philadelphia. William wanted to go back to sea, which was the only life he knew, but Catherine adamantly disagreed. He had an opportunity to go on an expedition to the Pacific Northwest on the Astor, but Catherine was so much against it that he turned down the offer. The ship sailed without him and never returned. It reached Oregon, but Native Americans killed the entire crew. After this, William abandoned the sea and moved to New York City, where he went into the shipping business in partnership with his brother Thomas. However, this was not a good time for the shipping industry. The brothers had a string of bad luck that ended in financial disaster. Their ships often sailed to the West Indies, and one was lost on a return voyage, weakening the business. In 1807, President Jefferson placed an embargo on American shipping out of U.S. ports. The Wickham brothers had a ship loaded and ready to sail. Because of their earlier loss, they were in a bad financial situation. Taking a chance, they decided to send the ship out anyway. Authorities caught the ship and confiscated it and its cargo, which ruined the brothers’ business. William and Catherine moved to Sodus Point in upstate New York, then at the edge of the frontier. They built a cabin and went into the fishing business on Lake Ontario. The future looked promising, but unfortunately, William and Catherine had gone from the frying pan into the fire. The War of 1812 had just begun, and in 1813, a party of British soldiers raided Sodus Point and burned the town, leaving only one house standing. Ironically, William, whose father went to prison as a British loyalist, had his house, boats and nets burned by the British Army. Before the British arrived, Catherine buried their silver in the woods. This included a tea set given to William’s ancestors John and William Wanton by Queen Anne for service to the crown during Queen Anne’s War – another irony. Lucy spent several months with her in-laws, and learned much about her husband’s family. Finally, with summer ending, she bid them farewell, and departed for home. Sodus Point claims the honor of numbering among its inhabitants the oldest person in Sodus, if not in Wayne county. This is Capt. 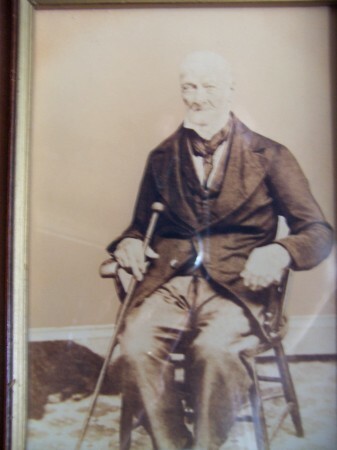 William Wickham, who is now in his 97th year. Although the last few years of his life have been spent in quiet, surrounded by his children, yet his early life was a remarkable one. When at the tender age of ten years, he evinced a strong desire to lead a seafaring life; and at the age of thirteen he overcame the objections of his parents, and shipped from Newport, R.I., (his birth-place,) in a merchantman bound for the West Indies. He followed the ocean for twenty-one years, and a history of his adventures and hair-breadth escapes would fill a volume. He was several times taken prison by piratical vessels of different nationalities. About the year 1800 he went to Philadelphia, where he was married. He sailed from the latter port for six years, and then from New York until the year 1812, when he removed to Sodus Point and engaged in the mercantile business, quitting the ocean forever. When Sodus Point was burned by the British in 1814, Captain Wickham’s store was destroyed, with its entire contents. He rebuilt the store and continued in the mercantile business until he was over sixty years of age, when he was succeeded by his son, Thomas; since which time he has followed farming, as more congenial to his tastes. He is still hearty and strong, and is one of the most industrious of men. Although there is not the slightest necessity for it, he will work; and cannot be restrained. A few days since, he received a visit from his son, Frederick, editor of The Norwalk (O.) Reflector, and when he was about to start for his home in the west, the old gentleman said – “Fred, tell the folks I am well, and that I never was so busy in my life!” The habits of industry formed in early life have become a secure nature to him. He is always cheerful and happy, excepting when he is likely to get out of work. 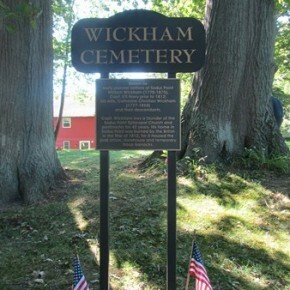 On May 23, 1875, Captain William Wickham passed away. He was buried in the family cemetery on the street that bears his name. His beloved Catherine and many of his family are also buried there. In 2011, the cemetery sign and a historic plaque were erected to honor this extraordinary man who was so influential in Sodus Point’s early history. The cemetery is open to the public and I encourage you to visit it and reflect on the legacy he has left. I think the old man would like that.